devoted to developing his talents. Eventually, became an independent master. than evolutionary against it..."("Leonardo da Vinci"). *Particularly skilled at painting, but also in other crafts such as military engineering. He was an inventor of machinery and he studied the laws of motion. Work Cited: "Leonardo da Vinci." Encyclopedia of World Biography. Detroit: Gale, 1998. Gale Biography In Context. Web. 15 Jan. 2013. Completed in red chalk when he was 60, this painting has become an icon of the Renaissance Man himself. Mural painting by da Vinci. Thought to have been started at around 1495. For more information, see "The Work." 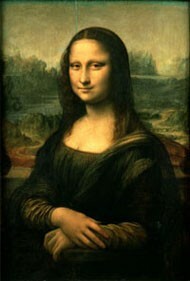 The painting, thought to be a portrait of Lisa Gherardini, is in oil on a poplar panel, and is believed to have been painted between 1503 and 1506.
commissioned as part of a church renovation project. disciples at the moment of Jesus's revealing the traitor among them. 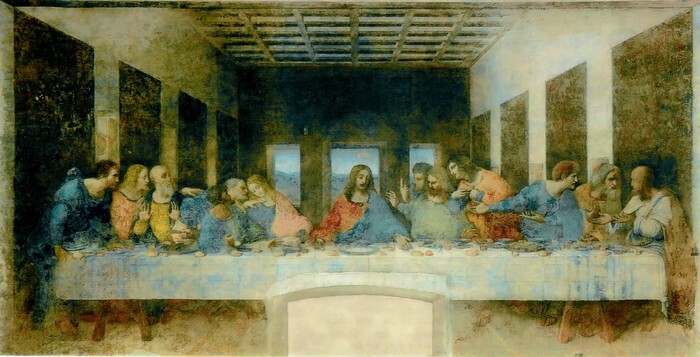 The painting is unique because it shows the individual responses of each man. experimentation with pigment, by placing paint directly on the plaster wall. shows the importance of patronage in the Renaissance. studies in the laws of motion and craftsmanship in military machinery. Work Cited: "Museum of Science, Boston." Leonardo Da Vinci. Web. 15 Jan. 2013. Ms. Ferrelli is a humanities teacher at Bedford High School.